Managing cravings for alcohol can be a daily struggle for people recovering from addiction. Returning to life at work or school after treatment can place many recovering addicts in the path of events, situations or circumstances that can trigger a relapse. An important part of alcohol rehab is learning to recognize these triggers and develop effective mechanisms for a life of sobriety. Here we take a closer look at the ways cravings for alcohol can be managed to prevent relapse into addictive behaviors. It is quite common – and socially accepted – that after stressful days at work or in response to emotional situations such as relationship breakups for people to declare that they ‘need a drink’. However, a recovering addict is exposed to a wider range of trigger situations due to the social circles they move in, peer pressure from others still drinking, feelings of depression or anxiety and a sense of having a huge mountain to climb to achieve sobriety. It is unwise to think that once someone leaves an alcohol rehab center that they are able to go back to their former lives with a new-found ability to decline invitations to join in the drinking should there be a family celebration or special occasion. Even mixing with former friends who are still abusing alcohol can lead to the temptation or relapse and so it’s essential to avoid enabling people, situations, and environments altogether. Determining the specific triggers behind alcohol abuse is a core part of inpatient alcohol rehab and every individual is completely different. Something that will be a trigger for one person may not be for another and that’s based on the issues that led to addiction in the first place. Counseling to understand and recognize triggers to alcohol cravings is an integral part of a personal inpatient or outpatient alcohol rehab journey. Once individual triggers for addictive behavior have been recognized during inpatient alcohol rehab, a strategy needs to be devised and implemented to ensure high-risk situations are avoided completely. The most obvious in nearly all cases of people with a drinking problem is to stop buying or keeping alcohol in the house. 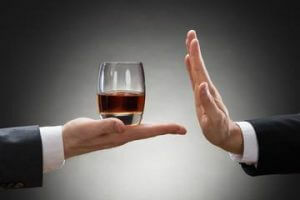 Requesting family members refrain from drinking while in company, declining invitations to events where alcohol will be served and avoiding bars and former drinking buddies are all ways to avoid risk of triggering a relapse. The key to reducing cravings for a drink is to remove the opportunity by avoiding high-risk situations. It is essential for anyone close to a recovering alcoholic to accept they have a chronic illness that is likely to stay with them for life. Once families have a clear understanding of the issue, they are able to help loved ones avoid trigger situations by providing support and consistent two-way communication. Someone who has completed outpatient alcohol rehab will have learned the communication skills they need to garner the vital support in their life of sobriety and this needs to be reciprocated by everyone close to them. Communication and support go hand-in-hand and can be a key factor in rebuilding close bonds that may have been damaged as a result of addiction issues. It is important to extend support networks beyond family and friends when recovering from alcohol addiction to include people with a positive influence that have a direct understanding of the addiction journey. Support groups for recovering alcoholics can work wonders to help make the necessary lifestyle changes required for a life of sobriety and can provide a lifeline at any time of night or day. Support from other recovering drinkers is given without fear of judgment or pressure and can provide a vital sense of ‘belonging’ on a recovery journey. Ongoing attendance is particularly important during the early months of recovery and ensures triggers for cravings are managed more effectively. Physical activity of any kind is a great way to stimulate some of the same neurotransmitters in the brain as alcohol and gives a ‘feel good’ factor that is very beneficial to someone in recovery. Starting from a low-energy level and building up to high-intensity exercise over time is much more likely to result in sticking to a new fitness regimen. The health improvements of regular exercise can be witnessed very early on which is great motivation to continue and it also introduces people to others interested in fitness and a more positive circle of friends. Recovering from alcohol addiction is undeniably a challenging journey although it is possible to smooth the transition to sobriety with the right kind of treatment, support, and communication at the best alcohol rehab center for the individual. Discovering the root causes of addictive behaviors is a giant step in reducing exposure to trigger situations, making the chances of relapse more remote.